Off Season This is the place to kick back and shoot the breeze. I am still looking to fill a doe tag with the smoker. 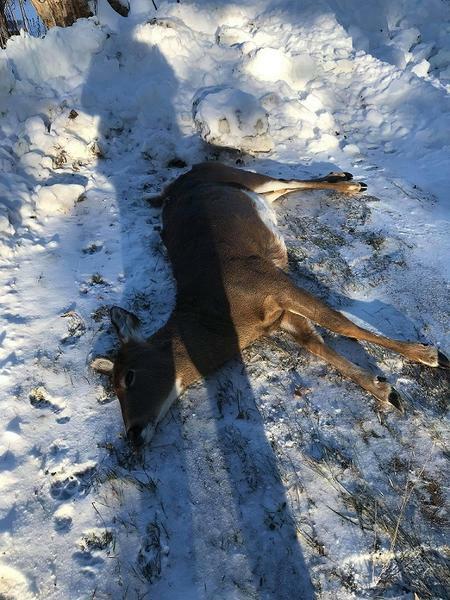 I passed on a small one and can't seem to cash in on a mature meat deer. Got until Sunday. Good luck to you CI.. I can’t shoot any does here and had them blowing, stomping, and walking right by me. But no buck would come in. I put sent out and that stuff appeared to make him more cautious and he would move farther away. But I did get to see game almost every single day out.. Thanks Jake and now I will have to wait until winter is over so that I can blast a turkey or two..
Turkey is already on my mind and I still have a few weekends if deer season to go. The Jeep issue they stated is the steering rack. There is none in stock right now and they need their insurance adjuster come and check it out because of the cost to replace it. So they can’t touch it until whoever it is gets there which will be a couple of days. With no part in stock right now it is going to be interesting on what takes place. I could of had the last three days hunting if the Jeep never messed up on me. It could of been much worse if it went out on the highway instead of a dirt ice covered road. So I am thankful for that. I have googled it and this problem appears to happen more often than one would think. Anyway the bucks all survived from me and come next year hopefully I will get one of them.. The issues from cancer messed up my hunting season due to the fact setting in the cold for around an hour gets me coughing.. We all know if your not completely quite that they will go the other way.. Anyway on my way to work on December 20th I see a road kill over town so I stop and take it back to the house.. I went to work and called the game warden for our area and no problem with keeping it. It was 16 degrees out when I picked it up. So I started taking care of it after work. I got 62 lbs of boneless meat of it and threw away around 10 bs due to damage from being hit. So I am estimating it to be around 170 lbs dressed.. 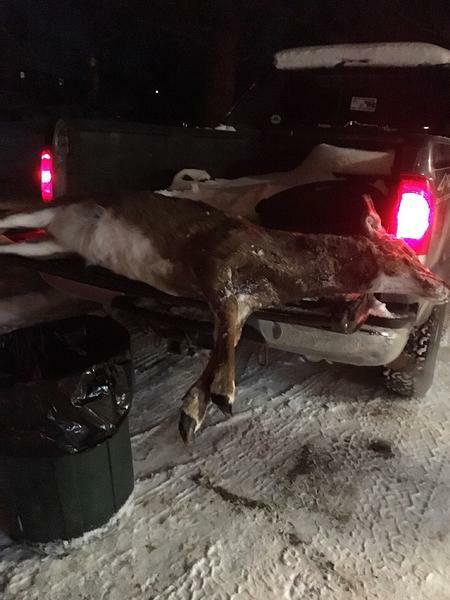 It was a huge doe for these parts.. Clearly not the way I prefer to get one but it is better than being wasted..That last picture is on the tailgate of my F 350 1 ton so it shows how big she was.. This was taken when I was getting ready to remove the ponch..
Last edited by Phil from Maine; 01-10-2019 at 09:19 AM. Phil, are you sure that aversion to the cold isn't just you gettin old? As I get older, I feel both temperature extremes a lot more. Seriously, I am very happy to hear that you're spending time in the woods and putting some venison in your freezer. Bummer on the Jeep. They're great rides but seem to have a lot of problems that they should have been figured out a long time ago. Having said that, there's still something magical about 4-wheeling in a Jeep. CI, I am not sure how to explain it but once you get bear fever, it's hard to get rid of. We can't bait or use dogs out here in CA, so it's either still hunt or spot and stalk. I do both and it's definitely an E-ticket ride when you're trying to still hunt or stalk a bear. Black bears normally don't want anything to do with humans but those "what if" exceptions tend to keep the blood pumping. I'm blessed cause our local deer season is 5 weeks long and can take up to 2 bucks. I've been tagging out on both bucks by the 3rd week of deer season in October so I focus on bear at that point. I can hunt bears until the season limit (1700) is taken the last Sunday in December. If I don't get a bear (I didn't this year), that means another 2 and 1/2 months of hunting. I didn't get a bear this year so blew right through Fall Turkey season and the first couple months of bobcat and fox. It's definitely a fun learning curve. I have a bunch of game cams out now to find their access trails to the next ranch and am learning a lot. I may try a treestand to get above their sightline and use a predator call to make it interesting. Since we can only use mouth or hand calls here (no electronic calls for bears), I'm thinking being in a treestand might be a bit safer than having a bear sneak up behind me on the ground and decide I look close enough to the critter call and it's dinner time. What a rush! The Jeep got fixed after around 5 weeks after I took it to the garage. Mainly waiting on the part to fix it. I asked them to program my trailer lights to work on it while it was there. They told me that it had a short in it. So after I was home I sent the dealership a link on it. They had me bring it back to program those trailer lights into the computer. All better now. I am happy to have it back but concerned if anymore issues arise. I also saw my chemo oncologist and everything went well. It has been now three years since my last treatments.. So three years and going since Tuesday! All times are GMT -8. The time now is 12:48 PM.